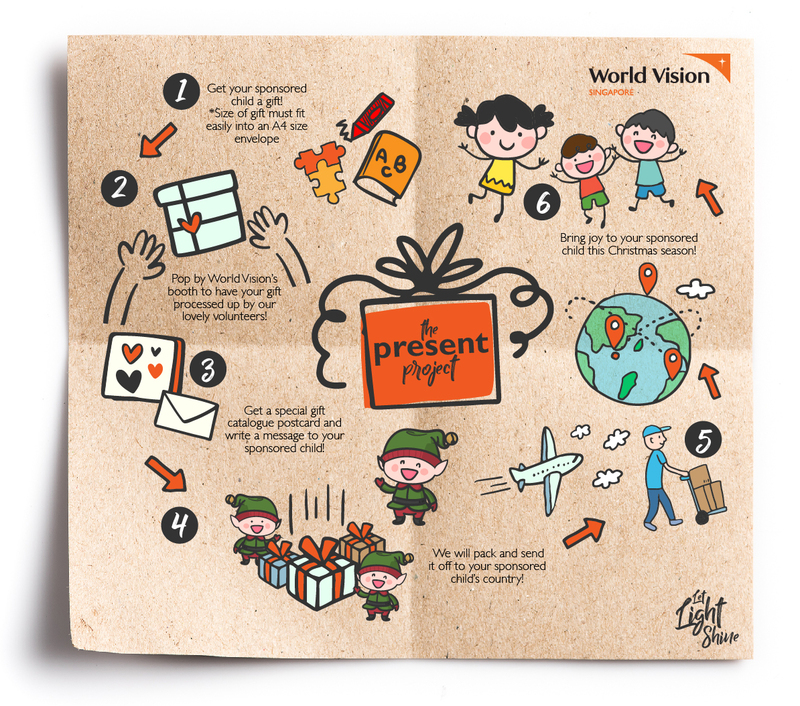 Come and find World Vision at various malls and experience the joy of sponsoring a child! There will be opportunities for your kids to put on ethnic costumes from our different communities and take pictures at our photo booth. You can also have your gifts wrapped or enjoy Christmas carolling sessions by our lovely volunteers at selected malls! Join us for special Let Light Shine Events at Junction 8 and NEX too. We look forward to seeing you there! If you would like to volunteer with us, sign up here! *Gifts MUST fit easily into an A4 size envelope. Envelopes will be provided to ensure that gifts can be received well in developing countries. Any item(s) that do not fit the size requirements will be rejected. Please do not send religious items, expensive items (e.g. jewellery), used items, battery operated items (e.g. watches), cosmetics, lotions, soap and food items. We appreciate your understanding! To help you find the perfect gifts for your sponsored child, we have prepared a handy guide for you! World Vision is a Christian relief, development and advocacy organisation dedicated to working with children, families and communities worldwide to reach their full potential by tackling the causes of poverty and injustice.Working in nearly 100 countries around the world, World Vision serves all people, regardless of religion, race, ethnicity, or gender. 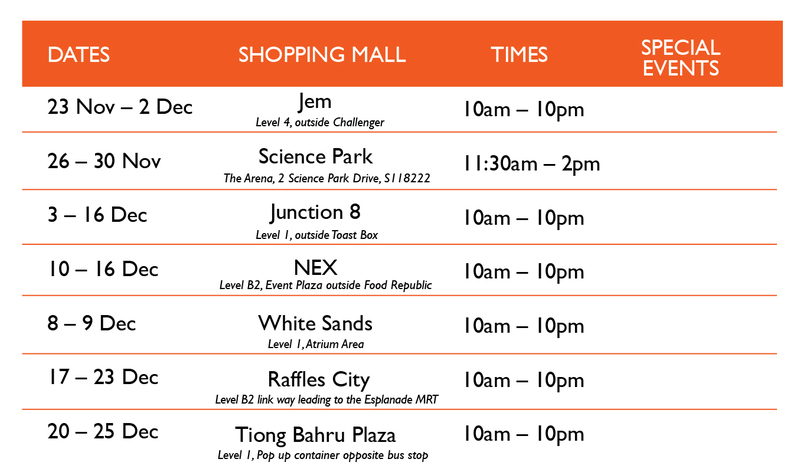 at Junction 8, Level 1 outside Toast Box from 11am – 9pm. From free fun-filled arts and crafts workshops such as soap making, create your own bottled snowman to face painting and balloon sculpting, there’s something for everyone in the family to enjoy! In addition, Annette Ice Cream on wheels will be giving out free ice cream sticks (limited to the first 50 redemptions) for anyone who sponsors a child or gives a gift. Drop by our World Vision booth to find out more! Make Your Own Bottled Snowman! Just in time for Christmas, World Vision is bringing charitable giving to life with a new, interactive pop-up shop in Tiong Bahru Plaza on 20 – 25 December 2018 from 10am – 10pm! Our Give-Back Gift Shop will feature life-changing gifts you can get for the different communities and countries World Vision Singapore supports. It will be a fun and educational time for people of all ages to deepen their understanding about World Vision's work and learn how you can play a part to support us in changing the lives of the world's most vulnerable children. Bring your friends and family and see how one simple gift can light up an entire community!